On Tuesday we had our weekly ultrasound appointment with Dr. Parker and his nurse Dori. I had NO idea we would be able to hear heartbeats this early. I'm only 6weeks!!! I knew their hearts were prematurely formed but just figured they were way too itsy bitsy for us to hear them just a putterin' away! Of course I, again, in true overly-horomonal Shannon fashion balled like a baby. Brandon just sat there and stared at the screen awe struck. Very surreal, truly amazing. 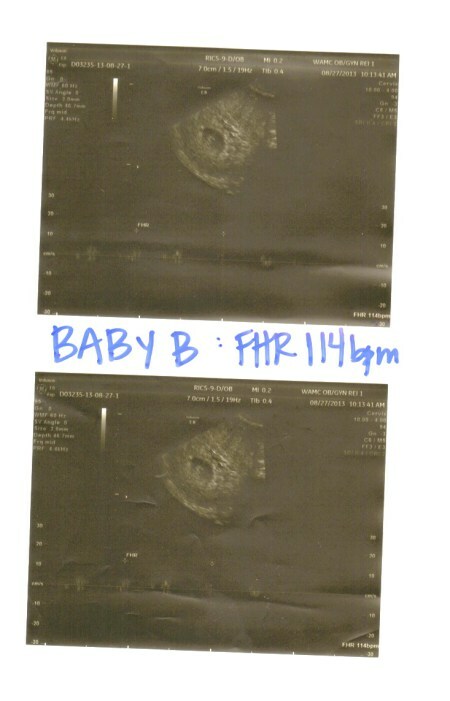 Here are some ultrasound photos! We also got a measurement of all 3 from their heads to their little peanut hineys! and I agree--They look just like Brandon, already!! Under each photo is the sound wave (very faint-but there) of their heart rates. These three photos are the baby's lengths. Each baby is measuring at exactly 6w1d. Perfect!! Baby C is measuring slightly smaller than A and B (as it has been from the get-go). But it'll catch up. Side Note: NO the colors on the photos are no indication of the sexes of the babies. We won't be able to find that out until 15-18 weeks. Happy Growing Little Peas! We love you so much already!